When we view love for God and people as our primary purpose, based on what Jesus identified as the Greatest Commandments, love even governs organization within the Church. It’s the cause, or reason, we provide organization, as well as the effect, or outcome. We might be tempted to say that we organize to put structure and order into what we do. However, if truly in tune with our purpose, we must go deeper, stating that we provide organization to enhance our potential to express love for God and people. Without love, structure and order merely provide a skeleton. Love breathes life and sinew into what we do, enabling us to move about purposefully. Without love, we are nothing (1 Cor. 13:2) and we gain nothing (1 Cor. 13:3). Is love the motivating and guiding factor behind all you do? Why have you put this or that structure in place? Our efforts end up at love. Organization in the church isn’t just about providing a structure to express our faith and goodness or to accumulate knowledge. It’s not even to provide order, as happens with self-control, or to sustain us, the result of perseverance. Nor is it to help us live a devout life to God (godliness). Rather it leads to not only mutual affection but love in its deepest sense — agape, God’s love. Hebrews 10:24 instructs us to “consider how we may spur one another on to love and good deeds.” That undoubtedly will take church leaders beyond mere words to organizing or putting structures in place to spur one another on. Consequently, as leaders we must ask how to bring about such an effect. — What can we do to increase the potential for such expressions of love? 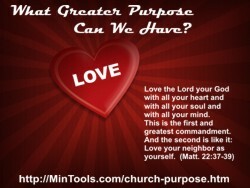 ← Previous Previous post: Organization Following God’s Purposes?